This is a re-branding as the group perform the works of Les Barker without Les. 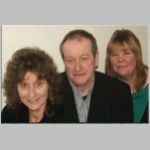 With Alison Younger, Hilary Spencer and Chris Harvey you get two wonderful singers and a superb musician creating a glorious evening of the master’s material performed with style panache and humour. Queen Victoria would be amused.